CBS All Access(LOS ANGELES) — Star Trek: Discovery‘s Sonequa Martin-Green has voyaged to where no other black woman has gone before: she’s the first black woman to lead the iconic sci-fi series in its nearly 53-year history. As Martin-Green relishes in her history-making role as Commander Michael Burnham, the actress tells Essence she’s also thinking about its impact and what that means for the next generation. Of course, making history at work also hits close to home. Martin-Green says she’s also considering what this means to her son, Kenric II, whom she shares with her husband, actor Kenric Green. 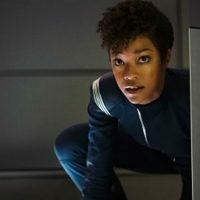 Star Trek: Discovery airs on CBS All Access.